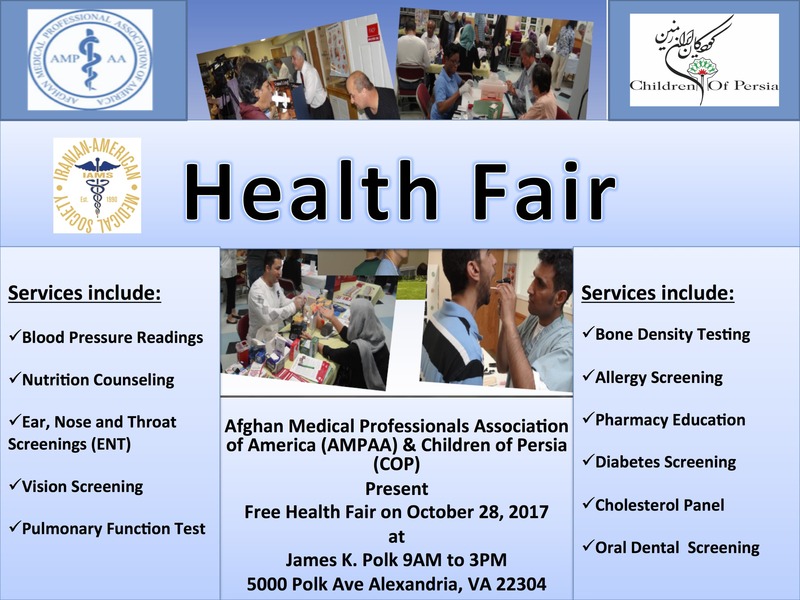 The Iranian-American Medical Society of Greater Washington (IAMS) is proud to support a community health fair organized by the Afghan Medical Professionals Association of America (AMPAA) & Children of Persia (COP). The health fair plans to offer free medical screening for over 25 services, such as blood pressure & cholesterol, blood glucose monitoring, bone density, ear, nose & throat, and vision. This is a free service for the community. Contact AMPAA at ampaa.usa@gmail.com for any sponorship information. 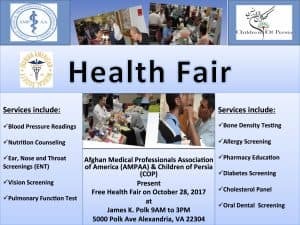 Physicians, health care providers, and anyone who is interested in volunteering in this health fair should contact AMPAA directly. Please help by submitting how you would like to help by completing the Google form.